All Things Musik is now offering online music lessons for all instruments! Lessons are taken through Skype, an internet-based audio and video program. Students and teachers can see each other throughout the lesson from anywhere in the world. The program itself is free and quick to download. Our online lessons have quickly become popular; students, parents, and instructors love the flexibility, fun, and ease of lessons this way. 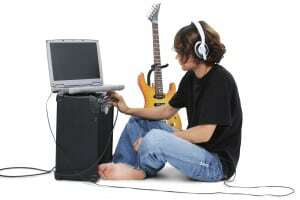 The list of benefits to online lessons is long and increasing. If a parent isn’t home, if traffic or weather pose an obstacle for the instructor, if summer vacation takes you from your home, or if your child gets excited about using technology, online lessons are a great fit for you and your child. To get started with online lessons with All Things Musik, contact us to enroll. You can continue with your current instructor and have the flexibility of location and time scheduling. All Things Musik instructors maintain professionalism while in the lesson and you as the parent can easily maintain online safety by viewing the history in Skype. A one-time download of Skype, available at skype.com. I love that my children can take piano using Skype! We don’t waste any time traveling; we don’t have to risk forgetting lesson books in the car, at school, or at home! Three minutes before the lessons begin; we log into Skype and get our books out from the bench. As a parent, I can listen in or communicate with our teacher at any time. I don’t have to worry about getting my children to piano lessons; instead piano lessons come to them. As a busy parent of four, it is truly a luxury to have this opportunity for my kids without leaving the house. In addition to all this, we have been fortunate to keep the same piano teacher for three years due to Skype when many other families have to stop and start lessons due to moves. I started piano lessons over Skype at the beginning of the school year. I really enjoy it. It makes it easier to make it to lessons on time, because you don’t have to leave your house, and no worrying about traveling to piano lessons or having someone come to you. It also gives you the chance to basically take lessons anywhere a computer and piano are available. Skype works great and we can play duets together or I can play a song and she can hear every note perfectly. We LOVE Skype piano lessons. For the past two years, we have had the luxury of our daughters taking lessons that are interactive, individually tailored, responsive, and convenient for our busy schedules. I am confident that the skills our daughters are acquiring through the Skype piano lessons rival 1:1 lessons. Skype piano lessons are so fun! I think it’s easy to follow along with my teacher and I have learned so much! Doing piano with Skype is cool. My teacher makes my lessons fun and the time goes by so quickly.